Learn how others have made an impact through their acts of giving to Ball State! A charitable bequest is one of the easiest and most flexible ways that you can leave a gift to Ball State that will make a lasting impact. Would you like to make a gift today that would enable you and your loved ones to continue to make charitable gifts in the future? 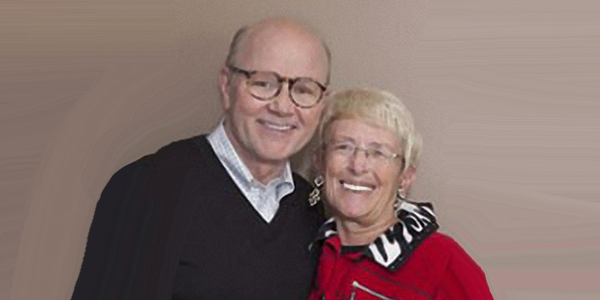 Joe and Carol Trimmer have spent 45 years at Ball State University dedicating their time, talent, and treasure to creative programs that impact the campus community and beyond. Joe was a longtime professor of English and the director of the Virginia B. Ball Center for Creative Inquiry, which provides distinctive, rigorous, and transformative immersive learning experiences for Ball State students. Fostering collaborative research and interdisciplinary study, each experience is designed so that faculty and students can explore the connections among the arts, humanities, science, and technology. Carol recently retired from Indiana Public Radio's home base, located in Ball State's David Letterman Communication and Media Building, after 15 years of service as outreach coordinator. Indiana Public Radio has consistently been recognized by journalism associations for its excellence in broadcasting and news reporting and strives to inform and entertain through exploration of the arts, events, and issues. When deciding how to donate their gifts to the university, the couple was inspired by the example of the late philanthropist Virginia Ball, who actively supported education, the environment, the arts, and the humanities. Virginia and her late husband, Edmund F. Ball, son of one of the original five Ball brothers, were major benefactors to Ball State and creators of the Virginia B. Ball Center. "Virginia and Ed wanted their gift to go to something innovative and creative that would benefit students," Joe says. "For Virginia, education and community were interconnected. When we looked at how we wanted to donate our gift, we wanted to do the same thing." The Trimmers' created a charitable remainder unitrust through the Ball State University Foundation to help programs they are passionate about and that inspire creativity, including Indiana Public Radio. "I'm always learning something from IPR. I believe in it with my whole heart. My donation helps to ensure that its future is around for a long time," Carol says. A charitable remainder unitrust was an attractive way for the Trimmers to give back because it provides lifetime income, an immediate federal income tax deduction, and reduction of estate and gift taxes. The remainder of the trust will also fund programs at the Virginia B. Ball Center as well as their own scholarship. The Trimmer Scholarship is awarded to sophomore Honors College students pursuing a major in the arts and humanities and who display creative inquiry, civic engagement, and dynamic leadership while maintaining a 3.5 GPA during the scholarship term. Joe and Carol have also made a bequest to the university in their will. "The reputation of the university rises with the success of its graduates," Carol says. "Our gifts will help to send qualified graduates into the workplace and develop a name for the university because of the innovative immersive learning programs and projects conducted on campus." Follow your passion with a gift to the Ball State University Foundation. Contact D. Mark Helmus at 765-285-8312 or dmhelmus@bsu.edu for details.